Thomas Gainsborough's "Blue Boy" is getting a long-awaited makeover and the public can get a glimpse of the transformation that's due just in time for the eternally youthful adolescent to mark his 250th birthday. SAN MARINO, Calif. (AP) — “Blue Boy” is getting a long-awaited makeover, and the public can watch as one of the world’s most recognizable paintings gets a little nip here, a nice tuck there and some splashes of fresh paint (blue presumably) just in time for the eternally youthful adolescent to mark his 250th birthday. Thomas Gainsborough’s stunning oil on canvas featuring a British youth dressed nearly all in blue has been one of the most sought-out attractions at Southern California’s Huntington Library, Art Collections and Botanical Gardens since its arrival in 1921. But it hasn’t had a substantial restoration in at least 97 years, and over time it’s become a bit torn and tattered, some of its colors have faded and, worse still, some of its paint is beginning to flake. All that begins to stop Saturday when The Huntington’s senior paintings conservator, Christina O’Connell, goes to work armed with an array of 21st century tools to restore an 18th century masterpiece. 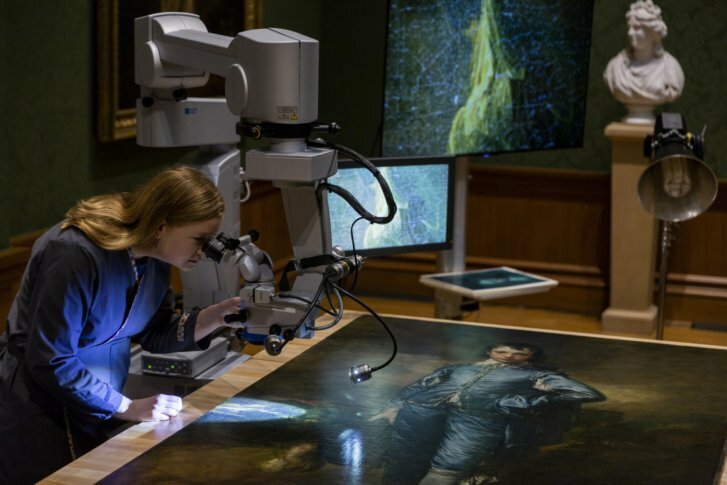 She’ll have a microscope that, at 6 feet (1.8 meters), is taller than she is and can zoom in on the painting’s smallest details and magnify them 25 times. She’ll have numerous digital X-radiography and infrared reflectography images of the work that she’s been compiling and studying over the past year. And, of course, there will be paint created to match what Gainsborough was using circa 1770. With all that at her disposal she expects to have “Project Blue Boy” completed about this time next year and the kid back on The Huntington’s Thornton Gallery wall, alongside other stunning portraits from the era, sometime in early 2020. As O’Connell toils in the same area where “Blue Boy” has hung for nearly a century, visitors will be able to walk up and watch what she’s doing. And, during occasional breaks, she’ll stop to explain it to them. “One of the reasons why the painting hasn’t undergone such an extensive conservation treatment before was because people always wanted to keep it on view. So this is a way to address the conservation needs of the painting while keeping it on view — so the visitors won’t miss him,” she said with a smile as she took a break from her work in the gallery earlier this week. Indeed, “Blue Boy” — whoever he was — has become a worldwide icon since Gainsborough put him on display to acclaim at Britain’s Royal Academy exhibition of 1770. The artist titled the work, “A Portrait of a Young Gentleman,” but when stunned viewers saw the full-length portrait of an adolescent dressed all in bright blue silk, from his tunic to the breeches extending just below his knees, they quickly gave him a nickname. Although Gainsborough, one of the greatest British painters of the 18th century, is renowned as a master of the brush, O’Connell says she won’t be nervous while a crowd watches her every move when she takes up her own brush to add touches — inpainting, it’s called — to replace what the painting has lost to the ravages of time. “We’re dealing with a lot of the usual suspects when it comes to a painting this age as far as condition issues are concerned,” she said, adding she’s repaired much worse, including a painting that was once handed to her in pieces. Still, this is “Blue Boy” so she’ll take her time. When The Huntington’s founder, railroad tycoon Henry Huntington, bought it in 1921, he paid a then-record sum of $728,000. Some Britons were reported to have cried when they learned their boy was leaving his native country. Art historians have never figured out exactly who “Blue Boy” was, although they have a pretty good suspect, said Melinda McCurdy, The Huntington’s associate curator for British art and O’Connell’s partner in the restoration project. Dupont, looking a few years older than “Blue Boy,” but not that much different, appears in the same suit in other Gainsborough paintings. “Blue Boy,” it turns out, also had a dog until Gainsborough painted it out of the picture. The kid’s furry friend was discovered in a 1994 X-ray that also is on display at O’Connell’s work station, along with X-rays that reveal nearly a foot-long tear in the canvas that was repaired so well it can’t be seen with the naked eye. What can be seen was when the tear was fixed, it was painted over with a color that didn’t quite match the original. O’Connell plans to fix that. She’ll leave out the dog, however. You can still see its front paws, which Gainsborough cleverly turned into rocks when he blended the rest of the canine into the landscape. “Composition choice, really,” McCurdy speculates on the artist’s reasons for sacking the pooch. The boy is indeed what many who visit The Huntington’s picturesque grounds come to see, along with the institution’s gardens filled with 15,000 varieties of plants, its library containing nearly a half-million rare books and its hundreds of other priceless paintings and sculptures. Which is why, says McCurdy, it’s important that people see the care, which isn’t cheap or easy, that must be taken to maintain such objects.